The Mystics' story is practically an exemplar of the best doo wop groups, in terms of longevity and recognition in the wake of momentary (but significant) chart success. The group had its origins in the Bensonhurst section of Brooklyn, a white ethnic outer borough enclave of New York City, which also spawned such vocal groups as the Passions, the Four-Evers, and the Classics. The group originated as the Overons, a quintet that included Al Cracolici (born April 29, 1936, baritone), Joe Stroble (lead), George Galfo (born 1940, second tenor), and Bob Ferrante (born 1936, first tenor). 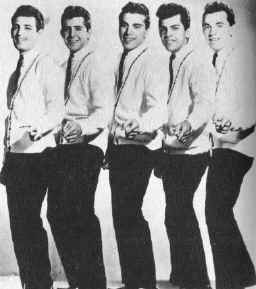 Their original bass left the group in 1956, and Al Contrera (born January 8, 1940) was brought in to replace him. The new lineup worked, and when Joe Stroble left sometime later, Phil Cracolici (born September 17, 1937) joined as lead singer. In 1958, they began looking for a new name and picked "The Mystics" after a search of the dictionary. Fate took a hand soon after when an engineer who heard their attempts at a demo record at a local studio hooked them up with manager Jim Gribble, who also represented the Passions. He signed them up immediately upon hearing their clean, radiant sound, and introduced them to Bob and Gene Schwartz, who had a label called Laurie Records, which had already been having success with white vocal groups from the New York area. Within two months they had a contract, but that was where the Mystics' fortunes changed.